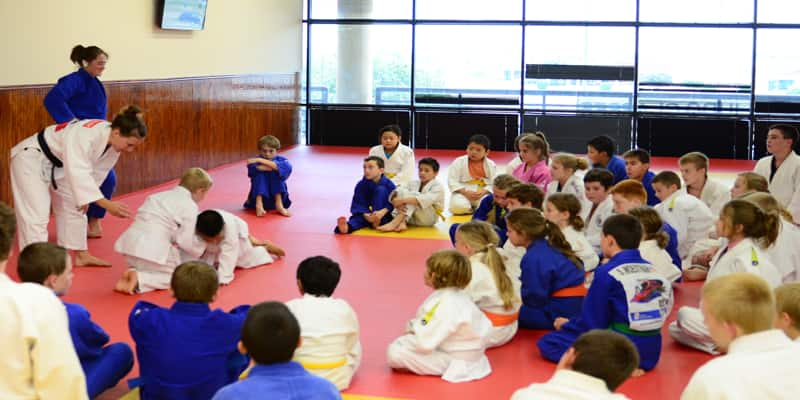 Two of the oldest judo clubs in Texas joined forces to bring Olympic Bronze Medalist Marti Malloy to a clinic over the weekend that attracted more than 150 kids and adults. Added to the bronze medal that Malloy won at the Olympic Games in London last summer, she recently took a silver at the World Championships in Rio de Janeiro, cementing her status as a top fighter in the 57 kg. division on the world stage and giving her lots of star appeal for wowing the crowd in Texas. Best of all, Marti Malloy is coming to Michigan this month. Click here for details about the upcoming clinic at Saito-dojo. This entry was posted on October 3, 2013 at 9:21 pm and is filed under Judo Clinics, Judo News. You can follow any responses to this entry through the RSS 2.0 feed. You can leave a response, or trackback from your own site.